When it comes to tried-and-true marketing tools, those that mean evergreen profits for companies each year, printed newsletters always work. In fact, I don’t believe that printed newsletters are really experiencing a comeback at all because printed newsletters never went away! There are a few reasons that many entrepreneurs and small-business owners don’t even like to think about printed newsletters. The first is that they think design and layout will be too expensive. Second, they feel that there will be enormous distribution and mailing costs. But the two most popular reasons people give for not producing a monthly print newsletter is that it takes too long and they don’t know what to write about. So why are printed newsletters still so eternally effective? Print is still the preferred way to read larger documents. Print doesn’t have to compete with as much “noise” as e-mail does. Physical mail can be scanned quickly and the junk thrown away. 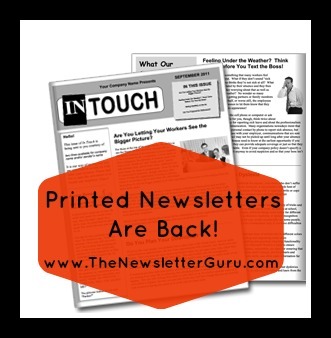 Yet another reason that the printed newsletter works well is that it shows the customer that you are successful enough to invest a little bit of money in your business in the form of a print newsletter. It adds credibility to what you say. After all, anyone with a computer can send email! But sending out your own printed newsletter shows that you are conscientious and reliable, and that you truly value your customers and the relationship you have with them. It instills trust and confidence in your product or service, as well as helping to build lasting bonds between you and your customer. Customer newsletters are an awesome way to maintain and build relationships with your customers, clients, and prospects. This is the one of the primary reasons your company should start a newsletter. In addition, a properly written newsletter is an awesome way to generate a lot of repeat and referral business. Here are five quick tips to focus on idea that will surely please your sales manager. Talk about the benefits of purchasing your product or service. Explain to your readers why your product or service is such a good value. Compare a new and improved product to one that they may already own. Point your readers to your Web site for more information. Make sure that your newsletter has a monthly special offer. If you do this on a regular basis, your newsletter will produce more positive results.